As traveler traffic at airports soars for the holidays, the Transportation Security Administration is looking into new high-tech scanners that will be able to digitally unpack carry-on bags, giving a detailed 3-D image of what's inside. The TSA predicts that an additional 100,000 to 400,000 people will pass through U.S. airport checkpoints each day from now until January 2 — reaching a total of 2.5 million people each day. To handle the crowds, the TSA has roughly 46,000 screening officers and 230 dog teams working checkpoints, officials say. But following yet another embarrassingaudit at TSA checkpoints earlier this year when officers failed to detect smuggled weapons and mock explosives, Congress is demanding the agency roll out new technology that can more effectively screen passengers' carry-on bags for weapons and explosives. While 3-D scanners already screen every piece of checked baggage — usually in the basement of the airport — the equipment so far has been too large to install at passenger checkpoints. 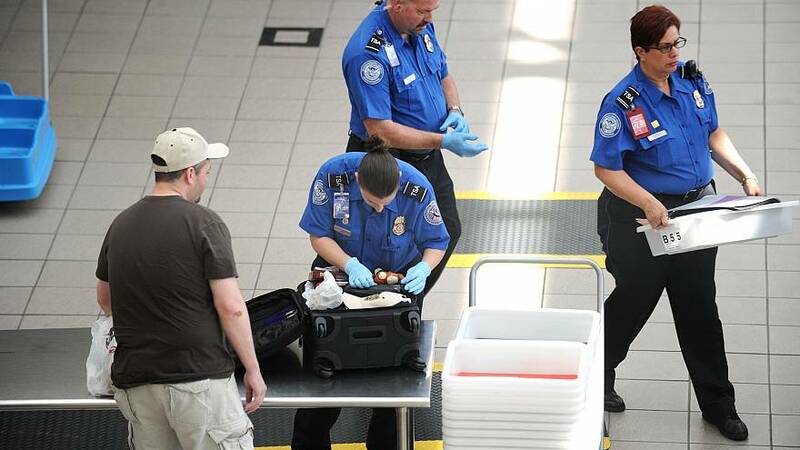 The newer models, however, are much smaller and can squeeze into the TSA security zones at most airports, experts say. To the everyday traveler, the device looks like the typical 2-D scanner now common at airports world-wide. But the new machines are a smaller version of the type of CT or CAT scanners common in medical offices and hospitals — and are able to slice through a digital image, allowing the operator to manipulate to peer beneath clutter like shoes, laptops, and books. "If you unpack the clutter, the officers are able to delineate what's suspicious and what's not faster," said John Stone, the director of sales for security systems at Analogic Corporation, one of the manufacturers of the new scanners. The scanners are already being tested at Boston Logan airport and Phoenix Sky Harbor. In 2018, they'll be introduced at New York's JFK Airport and Chicago O'Hare. Plastic and liquid explosives are among the most challenging types of weapons to detect. When suspected, the new 3-D scanners are designed to automatically trigger "Red Alerts," with a flashing screen that isolates and highlights the questionable item. "This system uses high powered algorithms to automatically detect explosives in the bag," says Analogic Vice President Mark Laustra. "So this is going to allow the passenger to just drop their bag and go through the walk through the magnetometer." Each new scanners costs approximately $300,000 and veteran aviation security experts say they represent a major upgrade at airport checkpoints. "It's going to be faster. It's going to be able to identify automatically not just explosives but weapons, which is going to help the screeners because you're taking the human factor out," said former TSA Deputy Administrator John Halinski. More than 107 million Americans were expected to travel by planes, trains or automobiles, beginning on Saturday Dec. 23 through Monday Jan. 1, according to travel company AAA.That would make this year the highest year-end travel volume on record, and a 3.1 percent increase from travel last year. About 6.4 million of those travelers will be flying, a 4.1 percent increase, AAA said. Meanwhile, a winter storm was spreading into the Great Lakes and was forecast to bring snow and ice to parts of the Northeast through Saturday, according to the Weather Channel.